A Vet Tool is now available! 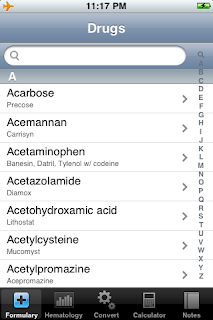 A Vet Tool is the perfect app for veterinarians, vet technicians, vet students, anyone working in the veterinary field, or just interested in more information about the drugs and tests used at a vet clinic. By downloading A Vet Tool you are getting five fully featured applications. The five applications are accessible through an easy to use tab based interface. A Vet Tool was created with the assistance of several veterinary professionals and will provide anyone in the veterinary field or interested in the veterinary field a great value for their iPhone and iPod touch.